The Stowaway Bluetooth Keyboard is the perfect productivity companion to your smart phone, PDA, Tablet, Media Center PC or notebook – almost any device that has Bluetooth supports this hot new product! With its genuine full-size keyboard with 18 mm spacing, the Stowaway Bluetooth Keyboard allows you to quickly type email, memos, or surf the web in optimum comfort. The sleek, award winning, patented folding design is featured in the Design Collection at Museum of Modern Art in New York. Its unique design allows it to easily fit in a pocket or purse, so you can take it everywhere, yet opens to a full size keyboard when you need it. A lap-lock is included that allows the keyboard to be used on a lap – perfect for airports and other tight spaces! Symbols, and international characters are also supported making this the perfect on-the-go keyboard! Also compatible with Bluetooth software stacks from Widcomm for Windows version 1.4 or greater and Drakar (Socket) Bluetooth Stack version 1.4.3 or greater and Microsoft Bluetooth Stack. For the Stowaway Keyboard to allow it to work on iPAQ 38xx and later. 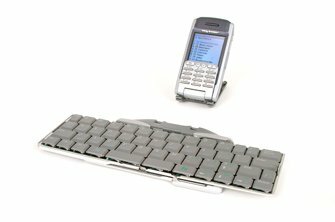 The original Stowaway Keyboard connects to IPAQ PDA 3600 & 3700 Series. This adapter will make your later model Compaq-HP iPAQ PDA 3800, 3900 and HP IPAQ 5100, 5400, 5500, compatible with this keyboard. HP IPAQ Series 4100, 2200, 4300 will need to have some of the adapter plastic filed down to match the bottom contour of the PDA. Keyboard serial number should begin with "A4TU" to be compatible with this adapter. If you have a Compaq-HP iPAQ 3800 series or above you could also try the Compaq Foldable Keyboard. This is a smaller, lighter device, yet actually more sturdy. However, it does not fit the combo case above. When folded it is much thinner than the Targus keyboard and will more easily fit into a shirt or jeans pocket.